Megan Loomis and Eric Scott Anthony. Photo by Anne Hudson. 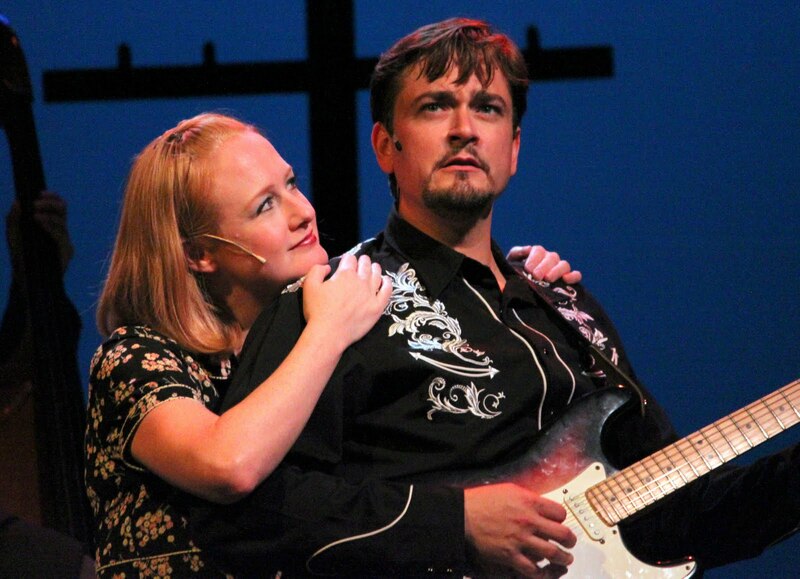 A musically gifted cast headed by co-director David M. Lutken playing multiple instruments gives a warm glow to the music of country music legend Johnny Cash, but it isn’t enough to spark a real flame in the plotless Ring of Fire: The Music of Johnny Cash playing at Ivoryton Playhouse. Through the first few numbers of the musical conceived by William Meade and created by Richard Maltby, Jr. the audience spends some time confused about just who these twanging and “sanging” folks are supposed to be. A prologue by Scott Sowers hints that we’re about to witness an autobiographical account of the Man in Black, but suddenly Eric Scott Anthony (who music directs) appears to be Cash. Is Megan Loomis supposed to be his wife, June Carter Cash as they sing “There You Go?” or are they supposed to be Cash’s parents? Later is seems that Lutken might be Cash with Deb Lyons as June. Jon Brown, Michael Hicks, John Rochette and Helen Jean Russell round out the talented musician/singers taking the stage. At some point it becomes clear that we’re trying to read too much into the vignettes dramatized as each song is sung. Though nicely staged on a minimal set (William Russell Stark, design) exceptionally lighted by designer Tate R. Burmeister, they are not parts of a plot. They just are theatrically depicted versions of the tunes loosely threaded together by a very few lines of dialogue, some two-step choreography (by Sherry Stregack, who co-directs) and voiced narrative that helps us understand that the songs are grouped by location/time frame/ theme: Beginnings, Memphis circa 1956, Back Home, the Grand Ol' Opry, the Johnny Cash TV Show, Prison and Redemption. Highlights are “Five Feet High and Rising” featuring a moving platform on which the cast members assemble to outdistance the rising flood water and “Flushed” and “Egg Sucking Dog,” humorous numbers performed at Grand Ol’ Opry (the orchestrations by Steven Bishop and Jeff Lisenby here are quite good). Vivianna Lamb (costume designs) also has some fun with flowing 1950 and ‘60’s dresses and the sort of outfits country singers wear. Lutken (whom Connecticut audiences will remember for his memorable role of the musician in Goodspeed's Big River) and Lyons’ rendition of the title song finally gets the audience singing along near the end of the first act, but there is something rote (a number of the cast have performed this musical multiple times on Broadway and elsewhere) and methodical about the overall feel of the show that keeps the fire from sparking into the conflagration of the foot-stomping, hand-clapping hootenanny it should be. And since there are a whopping 38 songs in the score, the Ring of Fire might feel more like a nine-level inferno for those who aren’t big fans of the music of Johnny Cash. The show runs through Sept. 4 at the Playhouse, 103 Main St., Ivoryton. Performance times are: Wednesday and Sunday matinees at 2 pm; Wednesday and Thursday at 7:30 pm; Friday and Saturday at 8 pm. Tickets are $40 for adults, $35 for seniors, $20 for students and $15 for children and are available by calling 860-767-7318 or by visiting www.ivorytonplayhouse.org Group rates are available by calling the box office for information.